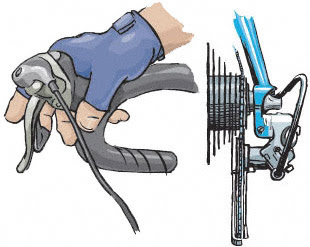 One of the most common questions we hear from beginning cyclists is "How do I shift gears?" Well, in addition to the expert advice on this and other topics you can get in our stores, we've created a new section on our web site that addresses how to operate the shifting levers for all of the major manufacturer's models of shifters. Just go to our Where to Ride page, check the list of shifting systems at the bottom of the page, and click on the one that matches your bike. There's also a Thursday 6pm ride from Deep Lock, but those dudes are superfast (18-20mph) and I wouldn't ride with them to save my life (because I'd probably die trying). They usually do 30 miles and they are definitely not social, at least not during the ride. They're generally social at the Lizard afterwards. Wednesday nights, we have a lovely ride from Revere High School at 6:30pm that also provides three levels of road riding which is basically: longer, faster ride; medium-paced social ride; and a slow road ride at about 10-15 miles. You can check out all our rides and events at our club website. We're a friendly social cycling club based out the Akron area. But we also have rides all over the place. Oh, whoops. I just scanned the list of the local rides in the table. Carry on! I thought you were supposed to grab hold of the wire thingy and yank it a couple of times to make it go back and forth on the doohickey in the back metal whatchamacallit. Hell this will be a lot easier!